After a quick ride out it was decided dive one would be at Buchanans wall. You could see the bottom from the boat, lots happening on the wall Turtles, Bullrays Nudibranchs, one group were lucky enough to spot a couple of Eagle rays. After morning tea all divers got in at Cleaner Station, using the current to get around to the Gantry. The top end was buzzing with fish, schools of Tarwhine, Bull eyes, Black cod, Bullrays. 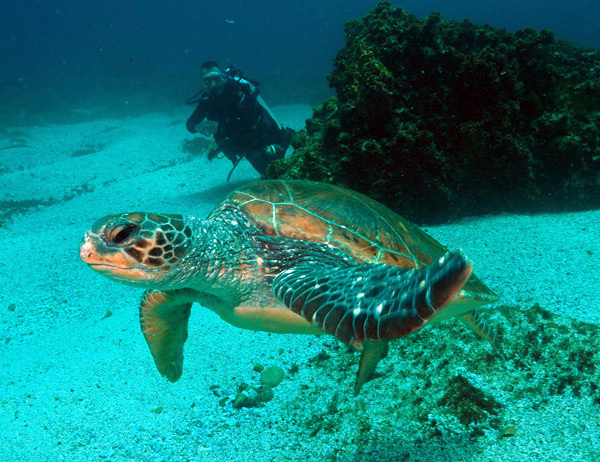 Two more Eagle rays were spotted at North Wall and At least a dozen Turtles were spotted at the Gap. Vis 30/40 Metres Water Temp 26 degrees.